As I prepared for our Wednesday lesson for Praying over our city; the Forest Fires raging in the hills caused me to think of fires in the Bible. I was reminded of Lot and Abraham and how Lot pitched his tent toward two wicked cities. Lot became an important person and often stood at the gate giving advice. God spoke to Abraham telling him that he was going to destroy the wicked cities, Sodom and Gomorrah, but Abraham protested and bargained with God. Finally God told Abraham, I will save Lot and his family but no more. God sent two angels came (in the form of men) to warn Lot - - and the evil of the city was revealed as the men of Sodom, both young and old came to Lot’s door demanding that he give them the two angels so that they could have relations with them. Lot stepped outside to haggle with the men. Finally the angels pulled Lot back inside and blinded all the evil sodomite men so that they could not find the door and eventually they left. Lot told his son-in-laws who were pledged to marry his daughters that they must flee, but they only scoffed and refused to believe. (How like so many today that make fun of Christians and will not believe.) Slowly Lot gathered his wife and two daughters as they hesitated to leave, but the angels finally had to take their hands and lead them out. Genesis 19:17 As soon as the angels gathered them outside, one of the angels said, "Run for your lives! Don't look back and don't stop anywhere on the plain! Run to the mountains, or you will be swept away!" Genesis 19:24, 26 Then the LORD rained down fire and burning sulfur from the sky on Sodom and Gomorrah. But Lot's wife looked back as she lingered behind him, and she became a pillar of salt. She was nameless, only known as Lot’s wife, but she hesitated to leave the place that had been home to her these many years. Sin was familiar to her, and she had affiliations and importance in these places. She was given an opportunity to change by leaving and begin afresh life, but no - - she paused, and delayed, and finally looked back. It was almost as if she had pledged herself to the affairs of the city and a contract had been made in the spiritual world of satan that held her in chains and she was bound. We can learn from this story that when we leave the past - - it is not good to look back with regret. How can we apply this to our city as we pray? Unknowingly many have made agreements and contracts with sin and God wants to destroy the contracts in His fire. Many in our city are bound with huge debts of sin that they cannot pay. Jesus volunteered to pay the price and clear theirs and our debt - - He took our place. Colossians 2:14-15 having canceled the charge of our legal indebtedness, which stood against us and condemned us; he has taken it away, nailing it to the cross. In this way, he disarmed the spiritual rulers and authorities. He shamed them publicly by his victory over them on the cross. 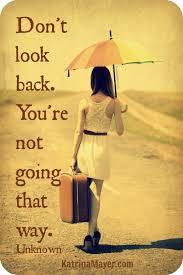 I was reminded of the old hymn "NO Turning Back" what a great reminder. How hard it is sometimes to leave what is familiar, even when it is not God's will for us. And it is hard to stop replaying the old 'tapes' of past regrets. Thank you for this post today. Guidance to Reveal God’s Will.